A new robot preacher allows users to receive automated blessings in different languages before it beams light from its hands. “BlessU-2” is currently on display in Wittenberg, Germany, a town which has close ties to Protestant figure Martin Luther, and was created by the Evangelical Church in Hesse and Nassau, according to the Mirror. “Lights then start to flash in the robot’s arms as it says ‘God bless and protect you’ and recites a biblical verse,” the Mirror continued. “After the blessing, the user has the possibility to print the dictum,” similar to a fortune teller machine. The robot can communicate with users in five different languages, and the blessing can be printed out for them to take with them as well. Church spokesman Sebastian von Gehren claims that the new machine has attracted those who have very little in common with the church, but now routinely visit “every morning and evening” to receive an automated blessing. 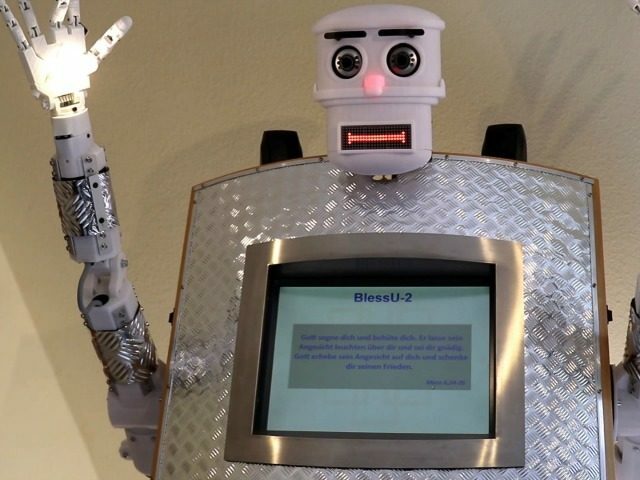 “In the future, there will not be a blessing robot in every church,” he concluded.